The 10-bit single screen display system is designed for medical/dental offices and hospitals. The What: Atmosphere has introduced its Atmosphere Healthcare 4K UHD (Ultra High Definition) 10-bit single screen display system. Designed for medical/dental offices and hospitals, the single screen 4K display system addresses the limited benefits offered by traditional waiting room TV setups. The system features Atmosphere’s proprietary 4K nature content that is specially produced to create a sense of relaxation and calmness for patients prior to treatment. The What Else: Available in 55-inch, 65-inch, 75-inch, and 105-inch 4K display configurations, the single screen display package features Atmosphere Healthcare’s proprietary high-resolution scenic nature video content. The scenic videos are specially produced to help induce a feeling of relaxation and calmness in patients. The single screen display package can be purchased and professionally installed either through Atmosphere Healthcare or an authorized AV integrator. 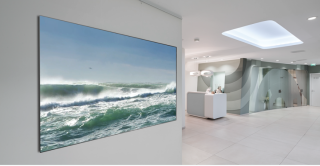 In addition to the single screen display system, Atmosphere Healthcare 4K display systems are also available in multiple screen solution and customized solutions. The Bottom Line: Shot in ultra-high resolution in natural environments around the world, Atmosphere’s 4K video content is produced with a special “Slow Movement” process. This technique gives the video content an almost-dreamlike quality that can measurably reduce physical symptoms of anxiety, such as high blood pressure and accelerated heart rate and breathing. Atmosphere’s Media Player application provides an intuitive and user-friendly interface supporting all of the system's features, including playlist creation, scheduling, looping and audio control. All features can be remotely controlled by the atmosphere healthcare iPad Controller App available on the App Store. Software updates and new content are done online.